Boilers are very effective and efficient heating options, and also relatively inexpensive. Getting a boiler installed in your home can not only save you dividends on heating but ensure that your home is set for any cold conditions that mother nature tried to throw at it. While boilers are typically durable, like every other large appliance in your home there will eventually come a time when it needs to be maintained, repaired, or replaced. If that time has come, and you need boiler services, the professionals with Jones Services are here to help. We are familiar with every make and model of boiler and will perform your installation right the first time so you can be assured of years of reliable boiler operation. Reliability – As a boiler ages it becomes less reliable, causing your repair bills to quickly pile up. The older a boiler the harder it is, in many cases, to find spare parts. This only adds to the expense. Efficiency – Newer boilers are much more efficient – very likely as much as 35 percent more than the one you have. Down the road, an advanced boiler will slash your heating costs substantially. Based on the money you save on fuel costs, an advanced system can pay for itself in as little as two years. Safety – Most boilers, regardless of age, are typically quite safe. However, a traditional boiler’s combustion chamber and flue system need a fresh supply of combustion air. If there’s a problem, that boiler can pose a danger to the room in which it is located. Advanced boilers, on the other hand, have all of their equipment enclosed within the boiler cabinet, thus substantially reducing any potential risks. We will get your boiler fixed fast so you and your family can go back to enjoying the warmth and comfort of your home. Our radio dispatched trucks are always stocked with a wide selection of repair parts, tools and equipment, enabling us to provide emergency boiler repair service. At Jones Services, we know how much you depend on your home’s ability to weather those harsh winter frosts. So when your boiler fails, make sure you also depend on the best heating service professionals in the business to restore warmth and comfort to your home. When a boiler is not properly checked on a regular basis, that can adversely affect its performance and lead to wasted energy and higher energy bills. Even a small adjustment to your boiler system can result in a savings of 10 percent on your bills – potentially hundreds of dollars a year. 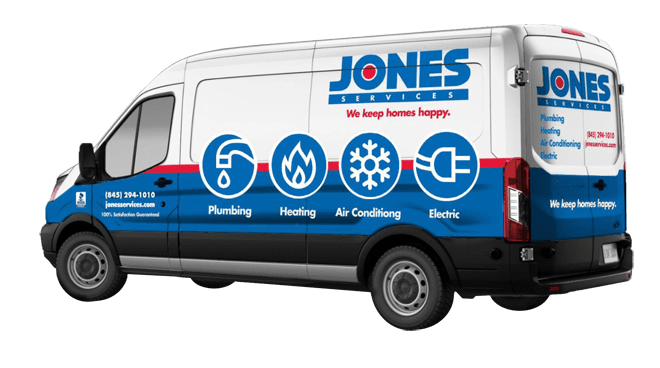 Don’t freeze up before the cold weather comes … call Jones Services regarding any needs regarding boilers and get warm again!